Combine 1/4 cup of Ponzu (Brown Label), rosemary, garlic, molasses, salt and pepper. Reserve 1/4 cup for vegetables. Rinse and pat dry chicken, trim fat. Loosen skin around chicken breast and baste meat with 1/4 cup of Ponzu. Drizzle some Ponzu inside chicken. Place chicken in a 9×9-inch pan sprayed with non-stick cooking spray. In a 9×13-inch baking pan sprayed with non-stick cooking spray combine potatoes, onion and bell pepper. Add reserved 1/4 cup Ponzu and toss vegetables. 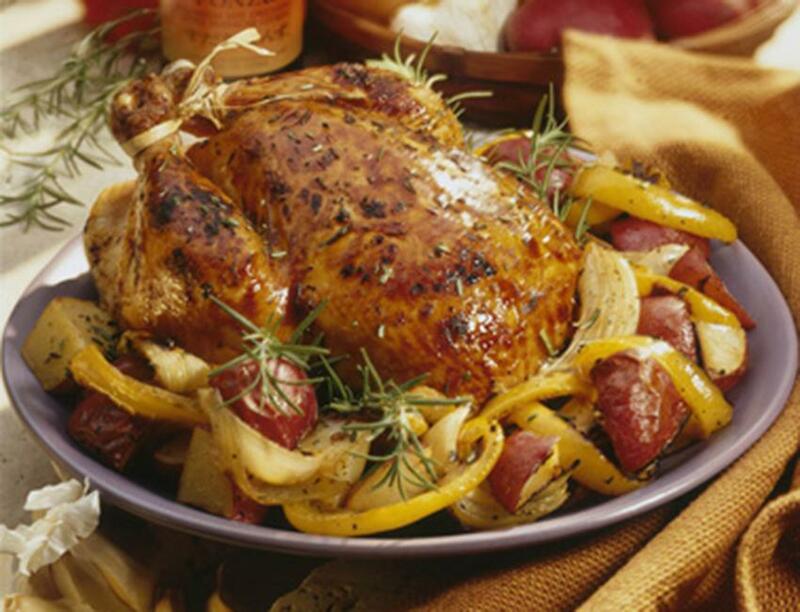 Place chicken and vegetables in preheated 475-degree (F) oven and roast for 45 minutes or until chicken is done. Brush chicken with Ponzu 3 or 4 times during roasting. Pour 1 tablespoon Ponzu over vegetables, toss and serve.